Science and Sociology is from beginning to end an exploration of what this implies for the social sciences, and sociology in particular. The authors argue that over the last several decades, sociology has become less a science and more a quest for isolated assessments of situations, whether they come from demographic analyses, survey research, or ethnographic studies. 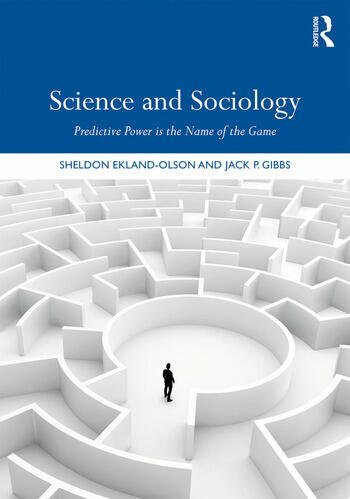 Above all else, this book is an attempt to promote and advance scientific sociology, and we write at length specifying the how and why of this objective. With this objective in mind, the question becomes: What would a scientific sociology look like? Sheldon Ekland-Olson joined The University of Texas at Austin after completing his graduate work at the University of Washington in Seattle and Yale Law School. He is currently the Bernard and Audre Rapoport Centennial Professor of Liberal Arts and serving as the Director of the School of Human Ecology. For five years he served as Dean of the College of Liberal Arts and then for eight years as Executive Vice President and Provost of the university. He has authored or co-authored several books and numerous articles on criminal justice, prison reform, and capital punishment. Widely recognized for his commitment to teaching undergraduates, he is the recipient of numerous teaching awards. His current interests are reflected in the book, Who Lives, Who Dies, Who Decides? ; an exploration of how communities have gone about justifying the violation of universally held moral imperatives. Jack P. Gibbs graduated with his PhD from University of Oregon in 1957. In addition to holding a faculty position at Vanderbilt, Gibbs also held taught at the University of California, Berkeley, the University of Texas, Austin, Washington State University, and the University of Arizona. At Vanderbilt, he was the Centennial Professor of Sociology, as well as chaired the Department of Sociology and Anthropology. Dr. Gibbs has well over 170 publications, including scholarly articles in referred academic journals and books. He has received numerous scholarly honors, including a Guggenheim Fellowship, election as a fellow of the American Society of Criminology, and recipient of the 1983 Edwin Sutherland Award from the American Society of Criminology. His research areas included suicide, status integration, research methods, urbanization and technology, sociology of law, criminal deterrence, conceptions of deviant behavior, capital punishment, social control, and terrorism. He is author of highly influential books Sociological Theory Construction; Crime, Punishment, and Deterrence; and Norms, Deviance, and Social Control:Sociology's Central Notion; A Theory About Control; and Colossal Control Failures.